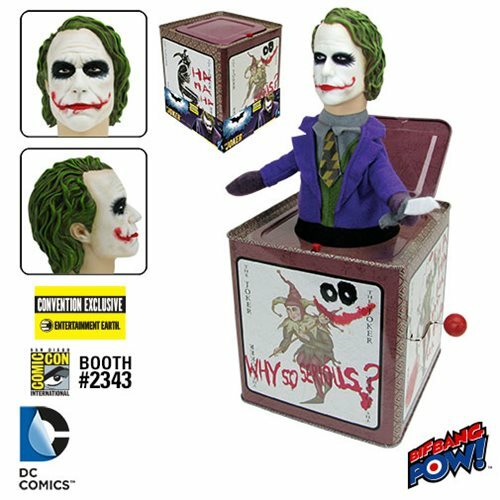 Retro-styled jack-in-the-box featuring THE JOKER™ from The Dark Knight™! What is lurking inside this musical tin box? Crank the retro-styled jack-in-the-box handle to play "Pop Goes the Weasel" as you anticipate that spine-tingling moment where… POP! Out comes THE JOKER™ from the hit 2008 film The Dark Knight! Measuring 5 1/2-inches tall x 5 1/2-inches wide, this classically designed jack-in-the-box features a detailed plastic head, sculpted by 3D Systems a.k.a. Gentle Giant, with fabric body. The Joker cards marked with "Why so serious?" and "HA HA HA" scribbled manically decorate the outside of the tin. Limited to only 3,000 pieces, this Entertainment Earth Convention Exclusive is individually numbered with a holographic sticker. Ages 14 and up.